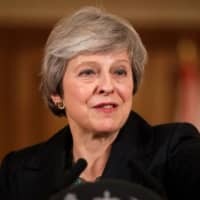 LONDON - British Prime Minister Theresa May is defying demands to quit as she battles to keep control of her fractious government long enough to deliver a Brexit deal that has drawn ire from across the political spectrum. Facing a revolt over her proposed exit agreement with the European Union, May said she would stay in office because the public expects her to see through their 2016 vote to leave the bloc in an orderly way. 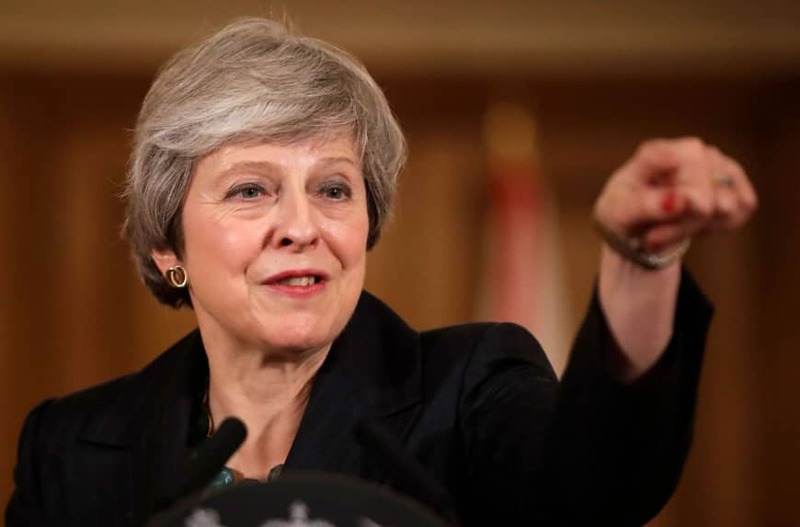 But she has a major battle on her hands with adversaries inside her Conservative Party and could be fighting a formal leadership challenge within days. If that happens and May is forced out, the U.K. will be just four months away from leaving the EU with no sign of an agreement on the terms of a split, a deepening political crisis and the prospect of financial markets and the economy going into a tailspin. May gave her defiant performance toward the end of another dramatic 24 hours in which the British political order was again thrown into disarray by what has become the biggest challenge of the country’s post-imperial era. Thursday began with good news for May when European Council President Donald Tusk announced plans for a special summit on Nov. 25 for leaders to sign off the Brexit deal. It was exactly what May needed to hear, with her government estimating that unilaterally ending more than four decades of EU membership could cost the U.K. as much as 10 percent in lost economic output in the long term. But over the three hours that followed, four ministers, including her chief Brexit negotiator, resigned from her government because they regard her plan to keep close to EU rules as a betrayal of the promises made to voters. Then, Jacob Rees-Mogg, the influential leader of a group of 60 rank-and-file Tories, announced he had sent a formal letter demanding a vote of no confidence in May’s leadership — the process that could quickly lead to May being forced from power. A flurry of others followed, though the crucial threshold of 48 rebels has not yet been reached. The insurrection followed May’s decision to force her Cabinet to back her Brexit deal at a crunch, five-hour meeting on Wednesday. Despite a heated argument, none of her ministers quit at that time — and May claimed victory. But her moment of triumph — and the relief it provided for business and finance leaders — proved short-lived. Raab was quickly followed by Pensions Secretary Esther McVey, who had a blistering argument with May’s officials during Wednesday’s meeting and was said to have been left in tears. Two junior ministers also quit in protest, before Rees-Mogg opened a new front in the internecine war with their leader. May spent three hours answering questions in Parliament on her proposed terms for the exit deal with the EU. Ultimately, lawmakers will have to vote on it, and the opposition Labour Party said it was dead in the water before they even knew the details. In a moment of high political drama, Rees-Mogg asked her directly why he should not write a formal letter to the party authorities calling for the vote of no confidence. Then, at 5:24 p.m. May began her news conference. To start with, it sounded as if she was preparing the ground to resign. Serving in office is a privilege, but also a “heavy responsibility,” she said. The pound was down 2 percent against the dollar as she prepared to speak. But quickly the prime minister switched direction and took on the critics trying to get rid of her. The choice facing politicians is simple, she argued: Back her deal with the EU, even if they don’t like it, or risk a chaotic and economically damaging “no-deal” Brexit — or even no Brexit at all. As she wrapped up, May joked with reporters, apparently unfazed by her ordeal and a precarious position that could still get worse. The co-leader of the 2016 pro-Brexit campaign, Michael Gove, was silent all day, with his office declining to comment on reports that he, too, could be about to quit May’s Cabinet. Two other ministers, Penny Mordaunt and Andrea Leadsom, are also said to be deeply unhappy and could also review their decisions to stay. What's next for Britain, Brexit and Theresa May?